To achieve an increased brand exposure is the primary goal of a dedicated social media marketing campaign. A business strives hard to enhance its engagement and come up as an authority figure in the respective industry. But what makes your brand exposure skyrocketing is the use of trending hashtags. One of the daily activities that a social media manager should do is to choose the best hashtags to use in their regular tweets and Instagram posts. 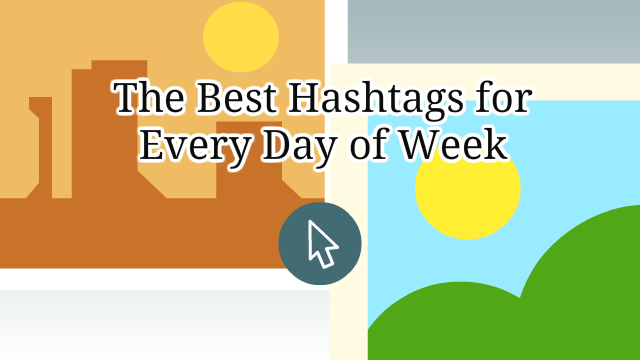 Why Use Hashtag For Days Of The Week? There comes an obvious question that why using a hashtag is really important for brand exposure. In order to have a lucid answer to this question, these top most reasons will give you the detailed insights. Hashtags for the days of the week encompass a particular theme. That is the reason, these are the most trending hashtags and play a significant role in brand exposure. Posting tweets, memes or amusing pictures on Twitter and Instagram with the relevant (and of course trending) hashtags make your posts widely accessible and visible to everyone. Putting such days’ hashtags automatically make your posts highly engaging and inviting. And so people love to share, comment and like such interactive or engaging stuff. This results in an enhanced exposure that will let your brand expand its network with credibility. Another obvious reason is the capability for your brand becoming an authority in that niche. Posting infographics, photos or tips that somewhat surround your niche is a great way to show your business as an expert. It is always a fun and creative way to interact with your target audience through such engaging stuff. Just suppose posting the fun photos of recent business trips, a motivational quote or showing something creative from your company….all these would definitely show an aesthetic and interactive side of your brand. This is the right time to bring a classic brand exposure for your business by incorporating the best hashtags. But if you think it is too much work, you can use an automated social media marketing software like Fan Page Robot. Fan Page Robot can generate the best hashtags for you and automate your Facebook, Twitter and Instagram content stream. And above all, it schedules and auto posts to Instagram without your mobile phone. Start your week with a motivational quote or something inspirational. In order to cheer up team members and followers, you can share your favorite tunes with this hashtag. Or tell others about an upcoming concert. Show your feline love on Monday. Post an adorable picture of a cat or ask your team members to share their lovely cat’s photos. Monday is about to feature a male personality. Yes, do feature a male industry leader, employee or team member. Note: But do not forget to retain professionalism. It has been a very trending hashtag and around 920,000 posts are there only on Instagram with this hashtag. It expresses grief but you have to show some positive thoughts that reflect how do you beat the dismay. Tuesday is famous for transformation on Twitter and Instagram. It is not only for the before and after photos of people who have transformed fantabulously, it is also for the brands. So post testimonials reflecting how your product/service has transformed businesses or customers. Why not to share a smart business tip? Share your expertise through appealing graphics. Another brand exposure tactic is to post cute photos of your furry friends with their tongues out. This way you will also have a massive exposure to more shares, retweets, and likes. Do not forget to share more positive thoughts on Tuesday. Post something interesting that grabs the attention of travel venturers. Share where your business has sent you recently. Monday is all about men, then Wednesday is for women. So, feature any female client, niche expert or employee for enhanced brand exposure. Twitter or Instagram is not only about cats. Post some cute dogs (or puppy) photos on Wednesday. Share what has been your favorite workout or exercise to stay healthy. Ask the team members to share their workouts as well. Or if related to your brand, then post some health advice. Sharing business tips is not only for Tuesdays. Do share some smart tips for brand exposure, marketing or any business (your niche) on Wednesday. It’s the time to open your memory avenues. Let’s share older memories of business trips, achievements or celebrations. This is one of the most popular hashtags on Twitter and Instagram. #ThrowbackThursday takes you down to the memory lane and you become nostalgic. So, start sharing older photos of fun moments, business trips or team gatherings. It is great to post about your business events and meetings. Show your gratitude for which you feel really thankful. Also, ask team members to share what they feel thankful for. Weekend is here. Tweet or Instagram about the happiness or fun you are going to have on the weekend. Spot an industry leader or other social media user that your followers should be followed. Ask everyone about their Friday’s (or weekend) plans. Suggest any particular hangout spot or something new to others for this night. What interesting book you are reading at Friday night (if not hanging out somewhere)? Twitter and Instagram is overwhelmed with cats on Saturday. Post about your feline’s love or some cute pictures of cats. And such pictures having positive quotes will be a bonus. So, finally what your weekend is going to be? Post your fun photos or business events that you have on Saturday night. It is an amazing hashtag that will give you a great brand exposure. This one is lovely to share about shopping, fun, music and such moments. Note: Again don’t forget to retain your professionalism. Sunday is for fabulous selfies and fun. Sunday is also there for more exciting plans. Share where you have been on Sunday. This can be any business brunch or a gathering of team members. It is a nice one to have pretty wide brand exposure. ← What Should I Post on My Facebook Fan Page?